The largest of the six neighborhoods found in Venice, Castello offers tourists a bit of a break from the hustle and bustle found in other parts of the city. A quiet neighborhood, Castello offers a taste of local life while providing quick access to any of the major tourist attractions. From the beautiful Giardini Gardens to the historic Arsenale, Castello is perfect place to have a peaceful stay. If you’re going to go the museum route, the Gallerie dell’Accademia has everything your inner art lover desires. The museum itself is stunning with works by Titian, Tintoretto, and Bellini. When I visited there was also a wonderful special exhibition on Hieronymus Bosch. The museum itself is a beautiful building and the perfect size so as to not be too overwhelming. Tip: While you’re there, be sure to grab a photo on the Ponte dell’Accademia, a bridge adjacent in front of the museum which offers great views of the Grand Canal and may be a little less crowded than the Rialto! Spend an afternoon at the beautiful Gothic Franciscan church, Basilica dei Frari. Offering over eight centuries of history and faith, the basilica is also a must-see for art lovers. The church is home to some masterpieces of Renaissance art, including Titian’s Assumption of the Virgin altarpiece as well as the Madonna di Ca’ Pesaro. Perhaps one of the most well-known sites in Venice, the Rialto bridge does boast a wonderful view of the Grand Canal, and while it can get quite crowded with people trying to get the perfect shot, the bridge is definitely worth a look! The Piazza San Marco or St. Mark’s Square is the largest and most prominent public square found in Venice. Here you’ll also find some of the largest tourist spots and some of the city’s must-see attractions. All centrally located, you can easily visit the Doge Palace and the Basilica San Marco in the same day – or buy a San Marco pass. While you might have to dodge some of the square’s determined pigeons, you won’t be disappointed with the architecture and art to behold in this section of the city. If you’re looking for something a little off the beaten path, or you’re ready to escape from the crowds for an afternoon, I recommend venturing to explore the history of Venice’s Jewish Ghetto. Simply stroll around this peaceful precinct or look into one of the guided tours of the three synagogues. Steeped in history, the neighborhood offers a quiet look into the past and a nice escape from the city’s main attractions. The most prudent piece of advice I can for someone visiting the city for the first time is: GET LOST. 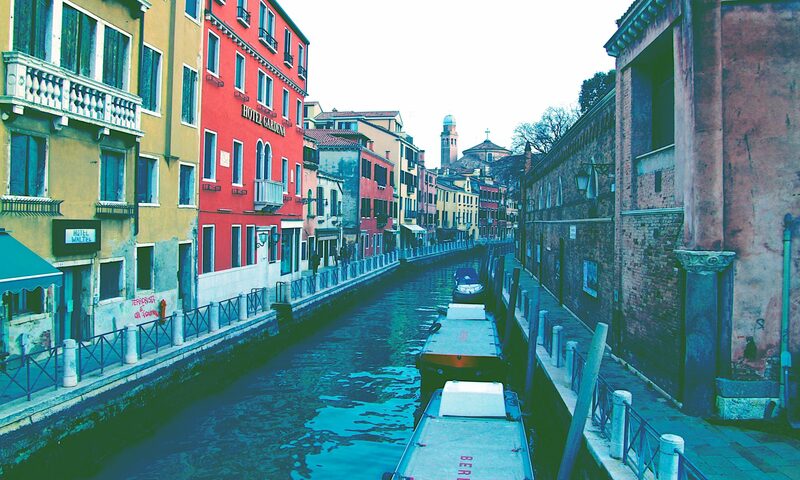 In a city where everywhere you look is art, you can’t go wrong in Venice. Don’t be afraid to wander the tiny streets and lose yourself in the city’s charm.